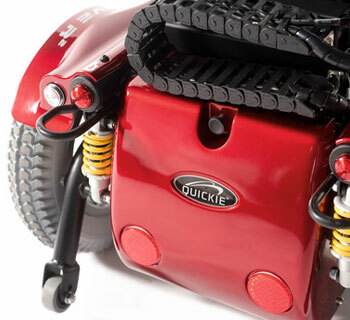 Quickie Jive R2 Powerchair Compact and Durable 13 kph. The Quickie Jive R² incorporates impressive outdoor and indoor performance. The compact and durable base offers great stability and control. Powerful motors can achieve up to 13 kph speed without compromising on manoeuvrability. Retro-fit the kerb climber and 10 cm kerbs are no problem for your Jive R². The Quickie Jive R² incorporates impressive outdoor and indoor performance. The compact and durable base offers great stability and control. Powerful motors and independent suspension can achieve up to 13kph speed without compromising on manoeuvrability, with integrated LED lights combining style and safety. The Jive R² seating system is sleek, beautifully simple, highly adjustable and colour-coded to match your chair. 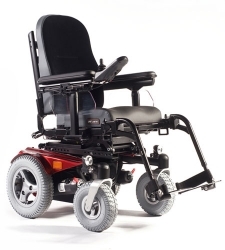 Adapting seating systems and accessories couldn’t be easier with the versatile seat frame and the back actuator which is cleverly concealed under the seat. Designed to fit you, the Jive R²'s seat frame provides simple adjustment of the armrest and seat. The Jive R² also has a low seat to floor height starting from 43cm. The Quickie Jive R² is transit tested according to ISO 7176-19 and therefore approved for transportation in a vehicle. The tests are carried out for the four point tie-down system and the optional Dahl car docking system for even easier attachment and transportation. You can further customise your Jive R² by expanding the control system with R-Net. Personalise your chair by assigning commonly used commands and settings to a single button. For conversations on the move, keep tweets and status updates flowing by using the Jive R²’s Bluetooth option to control your smartphone or tablet. Or control your environment with Jive R²’s Omni controller. If a joystick is not suitable you can even customise the way you control your Jive R² with a variety of speciality controls. The Jive R² can be further customised through Built-4-Me. Whether for clinical need, or simply to give the powerchair a look to make it stand out from the crowd, Built-4-Me can handle it. Simply ask your provider to contact the Built-4-Me team with your specific request and our experts will then assess and discuss any risk factors involved before designing and manufacturing a product to meet your exact needs.